This is the third instalment in Naxos’s complete Ring cycle from the Staatstheater Stuttgart (see reviews of Das Rheingold and Die Walküre). The standard is increasing for each part. What is special about this cycle is that each part has its own director and cast, which seems to be unique so far. The gain could be that for each opera we get new insights, new interpretations; the loss is a lack of continuity. The cycle is also available on DVD – which I haven’t seen – but on the CDs we are not “disturbed” by directors’ whims and can concentrate on the music. Even here though we miss continuity: there is for instance a new Wotan for each part, a new Alberich etc. Not having heard Das Rheingold, but seen some less than enthusiastic reviews, I approached Die Walküre with some apprehension, which to some extent was justified: Sieglinde and Siegmund were only intermittently palatable, Brünnhilde also had her squally moments and Wotan was authoritative enough but dry-voiced and sometimes strained. There were also some good things, however, and the playing of the renowned Staatsorchester Stuttgart under their experienced maestro Lothar Zagrosek was much to my taste, even though hearing Furtwängler’s famous recording some time after, showed that even more could be found in the score. What also disturbed me was all that stage noise that the microphones have a tendency to pick up with even higher fidelity than the orchestra and the singers. This is very much the case also with this Siegfried. One expects Siegfried’s sword to be forged, but this is also written into the score; here were sundry items dropped, thrown, banged, stamped – you name it – and sometimes I had to literally crouch behind the furniture to avoid being hit by unidentified flying objects. I was lucky, though, to survive as opposed to both Mime and Fafner. The Wanderer’s spear was demolished with stunning realism. Playing at moderate volume the stage noises are still bearable, but with headphones and at reviewer’s volume the background and foreground sounds may cause a nervous break-down. The music redeems these disadvantages and the orchestra play excellently with full and homogenous string tone with the important low brass chillingly menacing. The inspiration grows through the performance and when we reach the ultimate disc the interlude connecting scene 2 and 3 of the last act is really fiery (CD4 tr. 4). The prelude illustrating Brünnhilde’s awakening (CD4 tr. 7) is lustily evocative with its ecstatic high strings and harp chords. The whole final duet (CD4 tr. 8 – 14) – certainly Wagner at his most inspired – draws marvellous playing from the orchestra; no wonder they were named “Orchestra of the Year 2002” by the prestigious Opernwelt. Siegfried is notoriously difficult to bring off, to find the ideal tempos – something that Gregor Bühl stressed in connection with the premiere in Stockholm last September (see review), but to my mind Zagrosek is very successful. He is mostly well served by his cast. Gabriela Herrera isn’t the most ingratiating of Wood Birds but she isn’t bad either. Swedish born Helene Ranada, on the other hand, is a noble Erda, singing with warm, rounded contralto tones, suitably restrained. Attila Jun, who was Hunding on the Walküre recording, is a black-voiced Fafner, his big voice seemingly amplified and somewhat distorted by what I suppose is his cave. As the scheming Mime, Heinz Göhrig gives a many faceted portrait of the dwarf, detailed and expressive, and Björn Waag, actually more baritone than bass, sounds more like a real brother to Mime than most basses do. His is a bright, incisive voice and his word-pointing is telling. The greatest drawback is Wolfgang Schöne’s Wanderer. He is well inside his role and sings with grave authority. In the confrontation with Siegfried (CD4 tr. 1 – 3) he conveys an almost hysterical anger but his voice lacks bloom and there is nowadays a beat that all too often turns into a wobble. 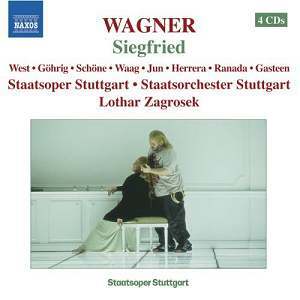 Siegfried himself is sung by Jon Fredric West who initially sounds no more than a pushed up Mime: the same whining tone and neither conveying youthfulness nor heroic nobility. He sings with intensity, though. He can be quite sensitive and grows through the opera until, in the final scene, the great duet with Brünnhilde, he stands out as a fully-fledged hero with baritonal tone. Apart from some less than discerning shouting, he shows real heroic qualities. If he can avoid being over-exploited in the heaviest roles, I am sure he can be a force to reckon with for years to come. The greatest singing on this set undoubtedly comes from Lisa Gasteen as Brünnhilde. I had many good words to say about her Brünnhilde in the Australian Walküre which I reviewed about half a year ago (see review) and her all too short appearance here only confirms that impression. Heil dir, Sonne (CD4 tr. 8) rings out with uninhibited power and beauty of tone and she also has a lyric vein, e.g. Dort seh’ ich Grane (CD4 tr. 10). She may have her shrill moments but they are easily forgotten in the face of such involvement and intensity. Though not similar to either Nilsson or Varnay – my favourite Brünnhildes – she is certainly not far behind in vocal and dramatic qualities. Among today’s Hochdramatische sopranos she has few peers. Melba have announced that their Siegfried, with Lisa Gasteen again as Brünnhilde, is due for release. I am expecting to have it for review in a few days. A mouth-watering prospect considering her singing here. There is much to admire in this latest instalment in the Naxos Ring cycle and even though it doesn’t oust the established top contenders – Solti, Böhm, Barenboim – it can still hold its own in a crowded field. Newcomers could do much worse than starting here - and at budget price too!